A natural 'magnetism' towards the formation of Scale Structures in Nature? Is the dominance of right triangles and squares justified from a scale structure perspective? Does the set of Pythagorean Triples include every integer? Sea water shallows photo © copyright 2005-2008 Wayne Roberts. All rights reserved. This photo depicts an 'in-principle' example of what Roberts terms 'scale structures'. The word 'scale' he applies here in a musical sense, i.e. musical scales. 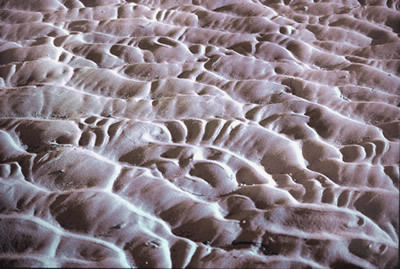 The tessellation of irregular polygons in seaside wave shallows (above) is a striking snapshot of lyrical 'metamorphoses'. every level of nature. Within a ripple is the Universe. And within the Universe, a ripple. In Nature, there is no artificial intelligence. There is only intelligence. theorising abridged herein on the web. such as Pierre de Fermat and MC Escher have inspired Roberts. The thesis and theorems contained herein were first published in print form (2003), then later to the internet (here) in 2004. The web site and book introduces a theory of scale structures developed by Wayne Roberts in the period 1995 - 2003 .Covert scale structure theory (or simply scale structure theory) concerns a new way of looking at the Universe. Inspired by 'musical scales' the book and this web site outline the theory focusing on many examples from history which point to a concept or organising principle Roberts terms 'covert scales'. The middle section [Refer to menu item 'An application of scale structure theory to number and geometry', and following] applies the theory to the very core of mathematics: the concept of the unit. From here, the theory progresses via an 'Escherian principle' to radicalize the theory of so-called 'square numbers'. The new theory proves its power by first predicting then finding new fundamental classes of triangle via a 'visual logic' that resonates with the structure and predictive power of Mendeleev's Periodic Table (arrangement) of the Elements. These special triangle classes or types Roberts names the eutrigon and co-eutrigon. The theory of scale-structures he then applies at a higher-dimensional level. Here the theory predicts that there should exist Pythagoras-like theorems for the new triangle classes which, together with the right-triangle, constitute a primordial scale-structure of great import to mathematics and number theory. Such theorems anticipated by the theory (outlined herein) are indeed found, again through an application of a key principle of the theory: resonant (gapless) interconnectedness. These theorems he formally ennunciates, both geometrically and algebraically. Scale-structure theory's 'roundedness' anticipates the existence of Pythagoras-like triples for the new classes of triangle: these too are found, and the parametric equations necessary to generate them are stated for each of the two new triangle classes. 'The way numbers are represented or 'written' (notations), the operations between and among numbers, and our understanding of the links between geometries as 'pure forms' (i.e. non-substantive yet information-rich entities) and numbers are set to be transformed via a new 'visual logic' whose power cannot be understated nor ramifications and reverberations foretold. Music alone is the only language on Earth that comes closest to the Universal Principle of Interconnectedness (UPI). The new language will be 'nonlocal', Universal. As with music, so too with Music. The mind, the neuronal architecture will resonate, synchronise, harmonise, recognise the pulse, the syntax, the organisation, the modulations and inflections, the reflections and symmetries. The units of mathematics, the Fundamental Theorem of Arithmetic, the equations and units of physics, the 'constants' of nature ... revisions at the very foundations of science are the logical conclusions to be drawn from the theory. The very concept of numbers themselves and of what consitutes 'irrationality' in number is turned around and reexamined from new perspectives. © 2008 Wayne Roberts. All rights reserved. typical asymmetric balance, and resonance of forms. word—a Scale Structure theory of Nature. This document concerns the elucidation of principles which may assist in the development of a new visual language and in new ways of thinking about the universe. ...we are fast approaching the time of reasoned and conscious composition, when the painter will be proud to declare his work constructive. There seems little doubt we are on the threshold of a rich new expressive means in the arts and of powerful new theories in science. The adoption and further exploration of the principles outlined below may lead to the development of a highly sophisticated language—one that might be understood universally. This is because such a language would reflect universal organisation in principle. Such a universal language could extend the potential for expression and communication far beyond what we currently know as art or language. 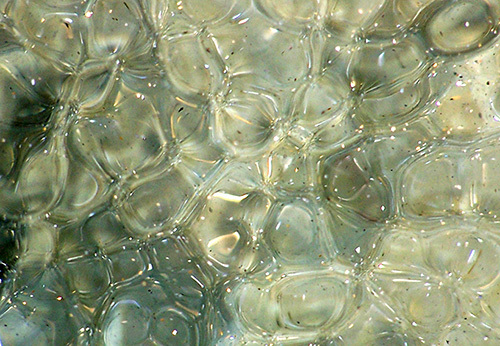 The gradual elucidation of scale structures together with syntactical exploration and interconnection of these will result in the discovery of not only a powerful expressive means but also a high-order language with the ability to extend science and art, in fact thinking itself, to a level we might only dream of today. The challenge for the new art is not only to discover resonant scale structures and syntaxes but to apply and combine these to form a new language of visual forms and events. The sign that we are on the right track in our quest will be that the new syntax and scale structures connect up in exquisite ways with many existing covert scale structures within mathematics, music, topology, linguistics, and the natural world. Ultimately, the new language will embrace them all. Then we shall know ourselves, each other, and the universe more fully. This document is therefore but a beginning; an outline of the principles of new ways of thinking, creating, exploring. It presents a new frontier, a new challenge. My hope is that it advances not only the cause of art, but of how we think, and of what we can know. The theory stands upon the shoulders of many giants of the past, bringing together their history-making breakthroughs within a single schema. Thus the theory is both new and old. It is new in what it brings together and in how it is brought together. In addition, new concepts are proposed and these are then applied to the foundations of geometry and number theory including Pythagoras' theorem. But it is a newness that builds upon the foundation of the individual achievements of many others; a consciousness not only of human history, but of the human discovery of cosmic origins, timescales, and orders. Finally, the document presents a number of conjectures arising from the theory, and whether these are someday proven true or partly true is perhaps less important than whether the general premise of the ideas here presented proves to be valuable to peoples or persons now or in the future. The theory anticipates major advances across many disciplines firstly, through a direct application of an expanded renewed concept of units and the syntaxes governing their interconnections and dynamics, and secondly, through a more generic indirect application of 'in-principle naturalism' arising from scale-structure theory. This is a companion web site published on the internet by the author in 2004 and intended to complement his book (W. Roberts, Principles of nature: towards a new visual language, 2003). The thesis and theorems herein were first published in print form. This web site offers free global access to the key ideas of the theory.